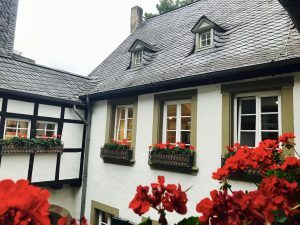 If you’ve ever been to Trier then you must know that Karl Marx was born here. Basically Karl Marx is to Trier as Bill Clinton is to Georgetown, except on a ironic level five times greater. This city makes a lot of bank off of its pop-up shops where you can buy everything from copies of “Das Kapital” and “the Communist Manifesto” to Karl Marx mugs, bobble-heads, and rubber duckies. I like to imagine Karl rolling around in his grave every time a Chinese-made product with a picture of his snail-face stamped on it contributes to the growth of the capitalist economy. One of the first things we visited here when we arrived was the giant Karl Marx statue near the center of town. You can also visit the actual house where Marx was born, which has been turned into a museum. Both the statue and the house (in which I appreciated the little details of vibrant red flowers growing in the garden) are two of the only places where you can find Mandarin Chinese written in this city. Both of these activities ,naturally, seem pretty taboo for any American and a lot of my classmates were visibly uncomfortable accepting that the man who gave birth to communism is the poster child here. But as a Chinese-American, I felt that the way Karl Marx is presented here is objectively neutral. All of the museum exhibits were completely informational and laid out a visual biography for Marx. It highlighted where he lived, how he developed his ideas, how he basically never stopped grinding, shed light on the family he had (which I never knew about), and talked about other world leaders which he inspired. Of course, one of those people was Mao Zedong, who I have mixed feelings about. But I was glad that the museum respectfully portrayed Mao in a way that made Chinese tourists feel included. It wasn’t too critical in my opinion, but not romanticized either. Germany today is much more “democratically socialist” than the U.S. and yet many Germans (especially of the older generations) consider themselves to be quite conservative. 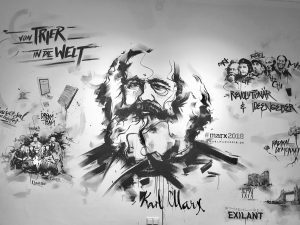 Five weeks is far too short of a time to try and understand German politics, but I have noticed that a bit of Karl Marx still inspires the social atmosphere here; especially in regards to the education system and work force. People like my dad, who works with tires and large equipment, aren’t looked down upon by white-collar workers like in the States. My host mother was actually very interested to hear about my dad’s work and commented on how useful being a handy-man could be in her next life. Going to college and even gymnasium (kind of like the second part of high school for Americans) isn’t seen as a requirement for a successful career in Germany. Young adults are encouraged to attend trade schools after what is similar to sophomore year in the U.S. if they have the talents and desire to. These apprenticeships can be for engineers, physiotherapists, computer programmers and more. Oftentimes students are paired up with a company seeking to hire them in the future. No core requirements, useless classes, or standardized testing required. About half of German teens take this path. The great thing about Germany is that people aren’t defined by their education or career statuses. To an extent, blue-collar and white-collar workers are seen more as equals and definitely have more comparable salaries in comparison to their American counterparts. Social classes still exist, so sorry, Karl, but there is definitely more of an appreciation for the laborers here than in the United States.